Repair the past. Heal the present. Embrace the future. Perhaps you or your animals have undergone multiple medical tests and nothing is found wrong, but you know something isn’t right. Or perhaps there is a diagnosis and medical and veterinary professionals are doing all they can and it’s not enough. Or perhaps the interventions are enough, but your healing is slow, painful and difficult. The process depresses your spirits and weighs on your mind. Every day is a struggle. Now what? A powerful healing life force permeates the universe. We see it in starfish regenerating a severed limb, animals licking their wounds to heal them, grass growing through concrete and cedars growing vertically from the trunk of a fallen tree. The healing power of energy has always existed and flowed through the hands of healers to people and animals. Healers in every culture have tapped into this force to help themselves, others, and animals. I encourage you to schedule a half hour complimentary telephone consultation or a full energy healing session for yourself, for someone you love, or for a beloved animal who shares your life. Services are client-centered, confidential, and provided in the privacy of a home environment at my Olympia office or at a distance. You alone, or you and your companion animal, are the only ones present. I am ready to see you when you arrive; no waiting. Services are tailored to your needs, your desires, and your beliefs. Energy healing is a complementary treatment that supports individuals and animals who also see physicians, naturopaths, chiropractors, and acupuncture professionals. Energy work is also a stand-alone intervention for issues that do not require medical or therapeutic intervention. Energy work helps our body, emotions, and spirit remain vigorous and vibrant. I also offer hypnotherapy, psychic readings, and mediumship with people and animals. 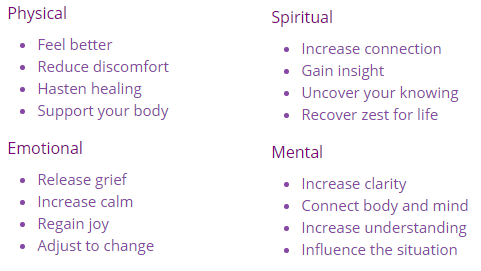 We discuss your situation and decide together on the approach to healing. Complement care for neck and back problems. Watch this video to see an example of Wanda giving brief psychometry readings based on personal objects of the participant. Thank you for visiting. Schedule an appointment now. Please enjoy this complimentary Chakra Clearing Meditation.